In Bulgaria, the coming of Spring is a very important event. Every year on March 1st, the country celebrates Баба Марта (Baba Marta, or Grandma March in English). In Bulgarian folklore, Baba Marta is a grumpy old woman whose mood can change rapidly, and this is the cause of the changeable March weather. 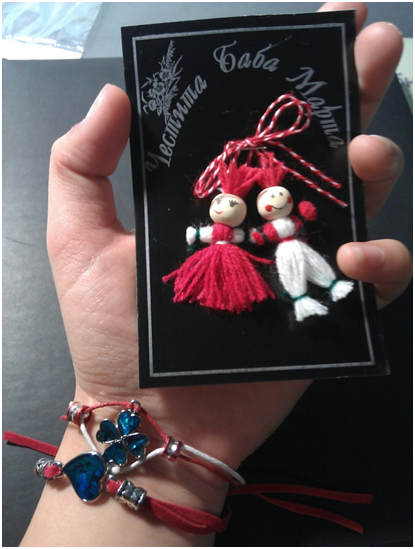 On March 1st and throughout the month, Bulgarians give each other martenitsi, which are red and white threads woven together usually in the form of a wristband. The martenitsi are exchanged in order to wish great health, good luck, and happiness to your family and friends. The most traditional martenitsi have two small dolls made from wool, called Pizho and Penda. However, there are many different types you can make and buy, and it is common to see street sellers everywhere in the lead up to March 1st! Martenitsi are usually worn around your wrist or pinned to your clothes. 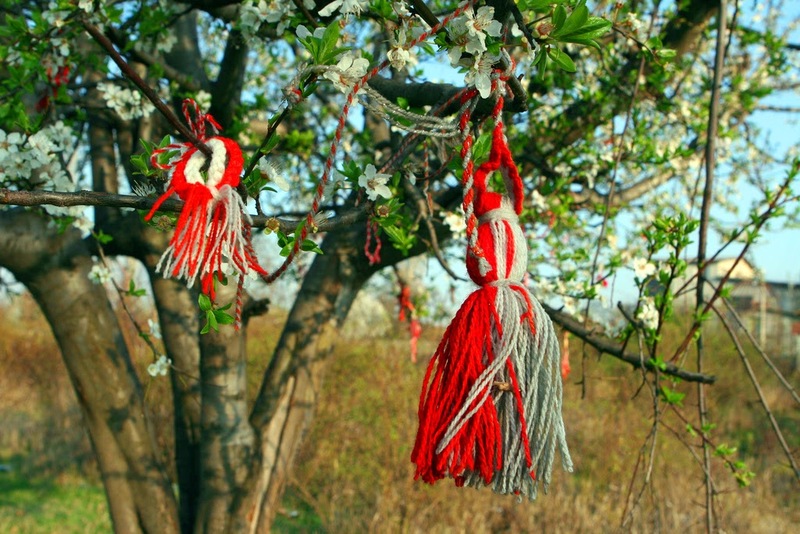 When you see the a stork, or a tree in blossom for the first time that season, you take off your martenitsa and tie it onto a tree for good luck in the coming Spring! On the 1st of March at breakfast time, I received two martenitsi from my host mom and my host sister. I was very excited about it. Unfortunately it was a Saturday, so I didn’t have a chance to see my friends. We went to visit our relatives and I got some more martenitsi! Later when I went to school, there were several friends who gave me martenitsi and it really pleased me. I consider it an action that shows our feelings for the ones we love. Some of them asked me to make a wish while they were putting martenitsi on my wrist. May Baba Marta bless us all! Making your own martenitsa is fairly easy, and all you need is some red and white wool! Here is a great tutorial if you want to try it at home. Don't forget to wish the recipients health, luck and happiness when you give them away!